So you have read the title and seen the photo. You can tell right away that this is an attractive piece. 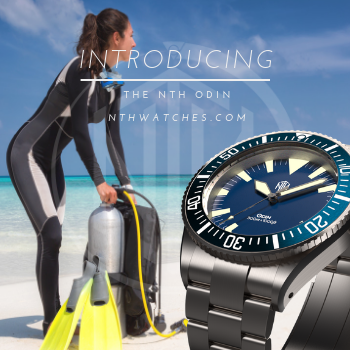 From its sturdy case, timing bezel, and 300m rating, you have correctly deduced that it is a diver's watch. The word "Automatik" tells you it is self-winding and German. Since you are reading a Time Bum review, it is a good bet that it is inexpensive. Just one burning question remains. What the hell is a Bombfrog? 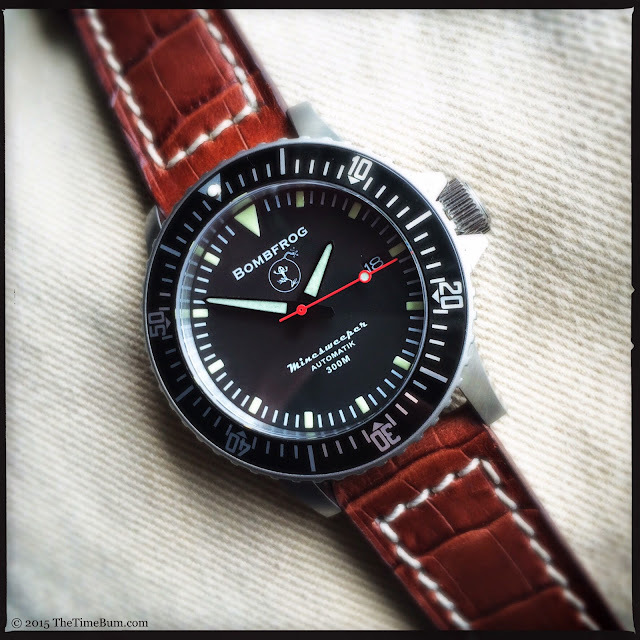 The brand is named for Minentaucher or combat frogmen. They are best known for clearing underwater explosive mines, hence the moniker and darkly tongue-in-cheek logo. 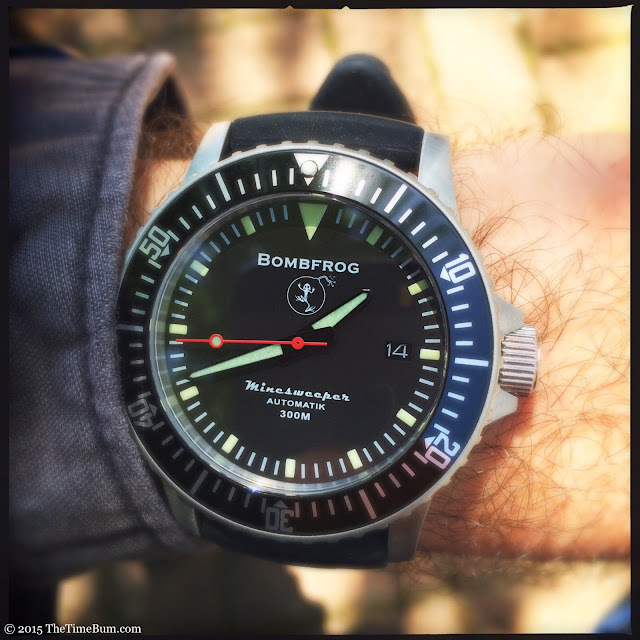 Bombfrog is owned by the wife of an active duty German Navy Explosive Ordinance Disposal technician, and for the past 8 years they have made tactical watches for various civilian, military, and paramilitary clients. 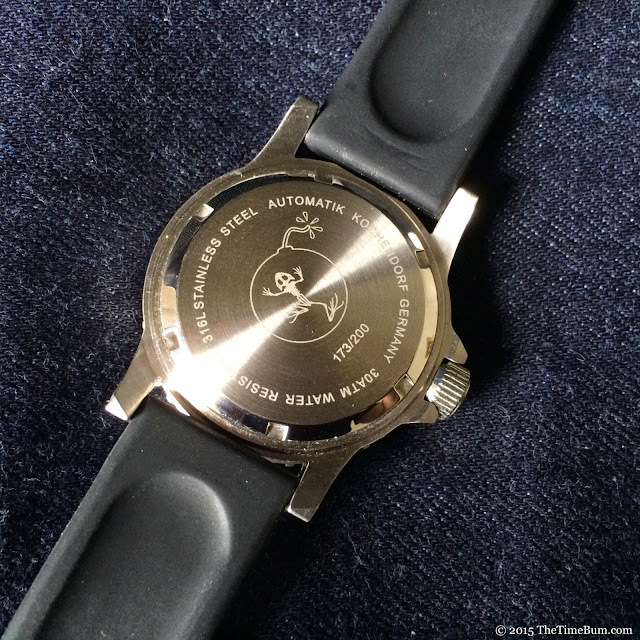 Various military customers have ordered small batches (as few as 30) with their unit insignia on the dial. Some of these are available for general sale on the Bombfrog site, but none is nearly as cool as the skeleton frog. The aptly named Minesweeper provided for this review looks every bit the rugged, military diver. It was designed by Todd of Bradystraps.com, a longtime Bombfrog dealer. 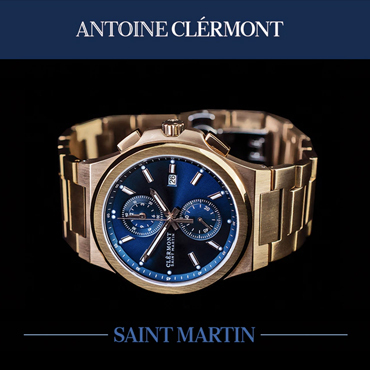 The stainless steel case measures 43mm across, 49mm long, and 14mm thick. It has blunt-ended lugs, flat case sides with top to bottom brushing, and angular crown guards, all of which create a solid, muscular appearance. This athletic bearing is underscored by the 8mm, screw-down crown nestled snugly between the crown guards. It is coin-edged, easy to operate, and undecorated. I prefer a signed crown, but I'd imagine it would be terribly difficult the squeeze that amphibian's skeleton on there. The edges and corners of the case are sharp, but not uncomfortably so. 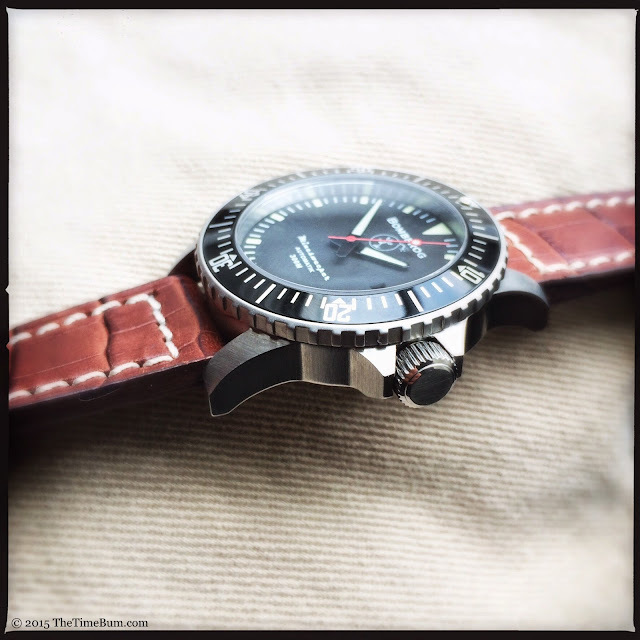 A Seiko NH35 automatic runs the show. This is a 24 jewel, hacking and hand winding unit based on the venerable 7s36 design. It hums along at 21.6k bph and has a 41-hour power reserve. Seiko automatics are an increasingly popular choice for micro brands and given their accuracy and reliability I can appreciate why. 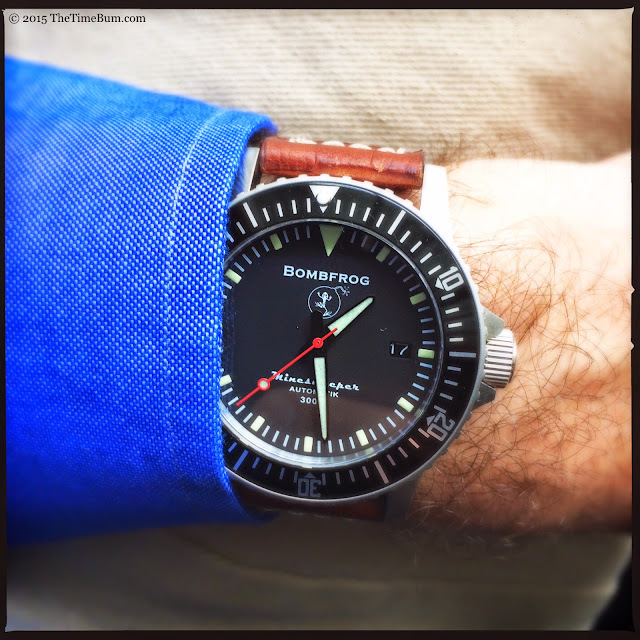 The dial is clean, attractive, and to my eye, immensely satisfying. 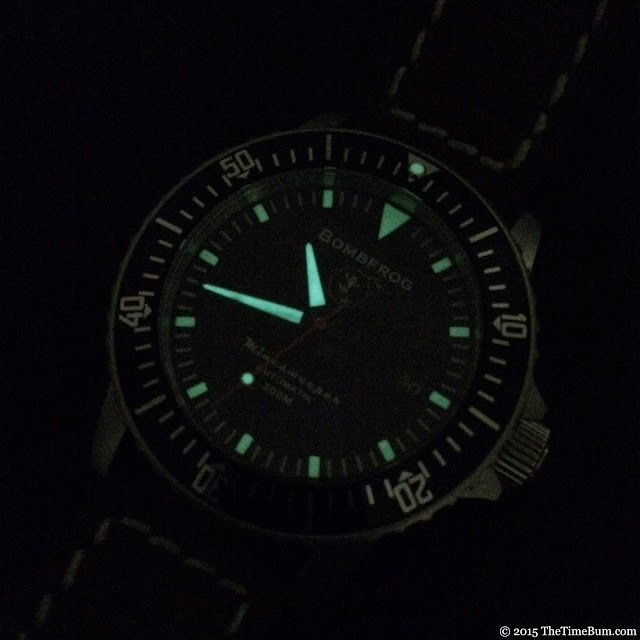 The hour and minute hands are black and filled with strong green-white SuperLuminova. Their obelisk shapes are purposeful, but uncommon, underscoring the no-nonsense military look while still lending a healthy dose of character. A red second hand with a luminous disk is the only pop of color on the dial. The white-on-black date display blends seamlessly into the flat black background. 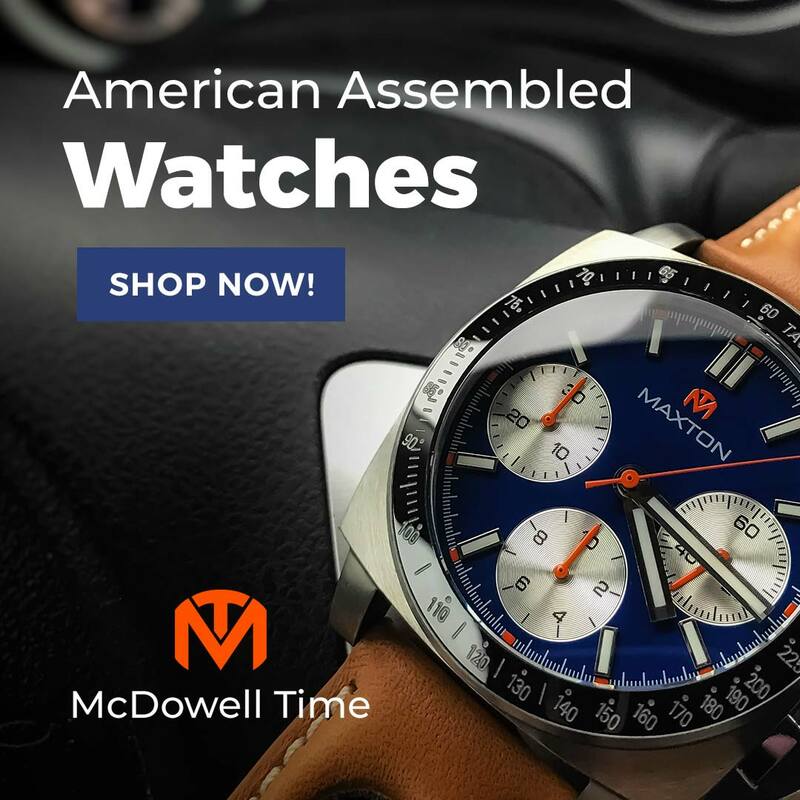 Square hour markers are comparatively small and set into the perimeter with the index, opening up the center of the dial and allowing the inverted triangle at 12 o'clock and the bezel markers to command your attention. The effect is most pronounced when the index reflects off of the rehaut, creating a starburst that links the two sets of indices. I was pleased to see that Bombfrog exercised some creativity in their choice of typeface, in particular, the subtle wedge serifs in the brand name and streamlined script for the model designation. 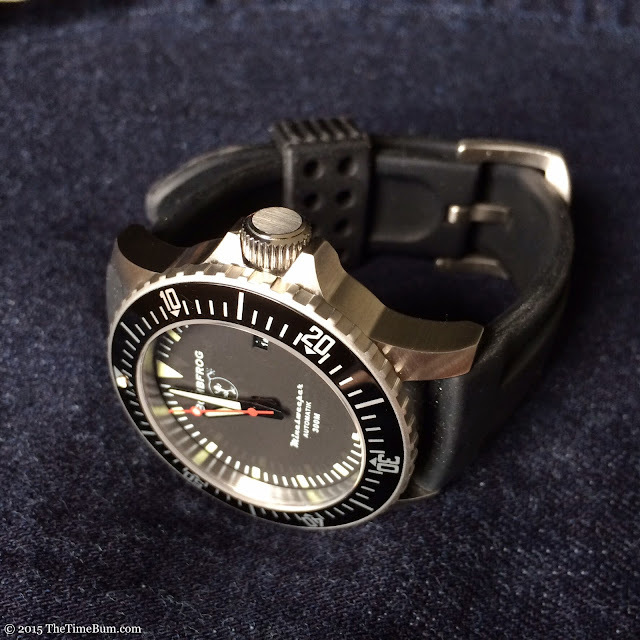 As stated on the dial, the Minesweeper is rated for 300 meters or 30 ATM water resistance. A sapphire crystal covers the dial while out back the threaded case back bears the image of Old Froggy. 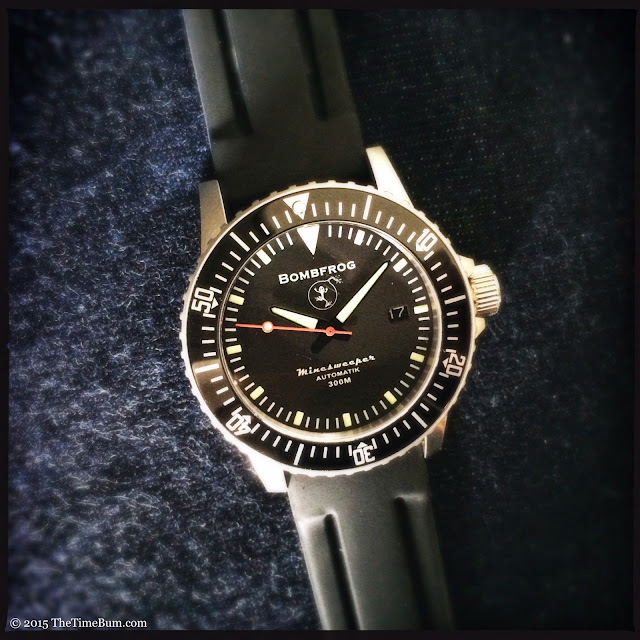 The 120-click bezel is aggressively toothed with a black aluminum insert and a luminous pearl. It looks great and moves easily through the detents, but it is a bit loose, rattling when tapped and displaying almost a full detent's worth of play. In my use, it never moved from its set position, but this will be a deal breaker for many. The watch ships in a useful zippered travel case and is fitted with a soft and comfortable silicone strap secured with a signed buckle. I had only two minor complaints. First, every time I put it on, I invariably stuck the tail through the vented keeper. 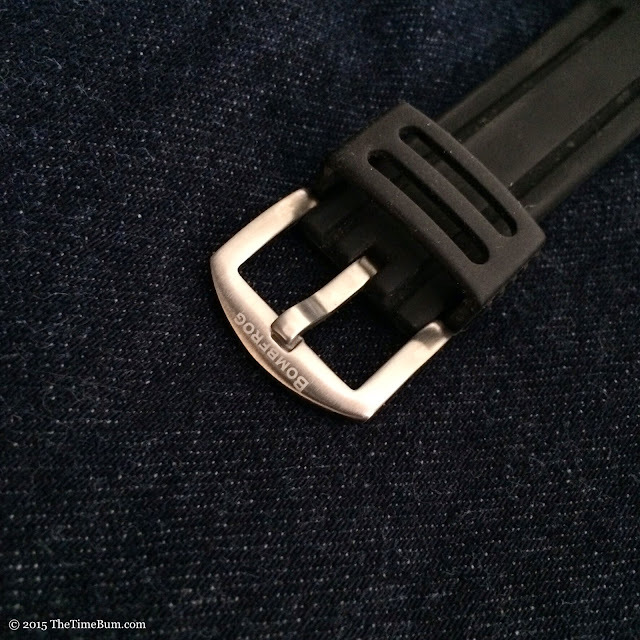 Second, I found the watch far too thick to wear under a standard buttoned shirt cuff with the stock strap. I solved the problem by swapping a leather Crown & Buckle Royale. It looks fantastic, but I'd suggest you hold onto the rubber for when it is time to dive. I enjoyed the Minesweeper's martial bearing and cheeky logo. 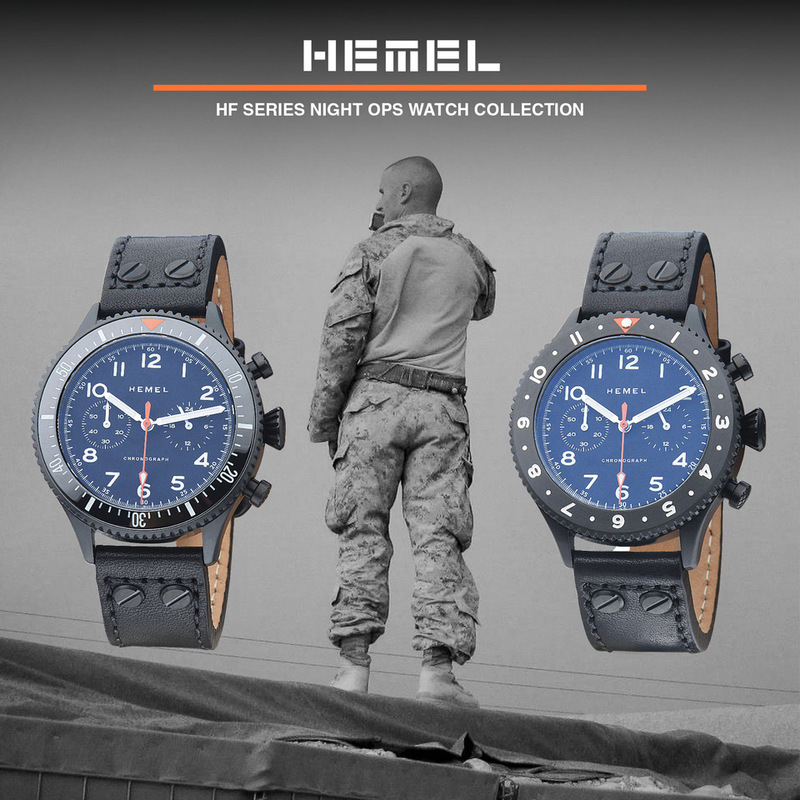 It sells on the Bombfrog site for €289 including 19 per cent VAT, so my fellow Americans can get theirs for about $270 at current exchange rates. Better still, you might discover a $15 coupon code at checkout. 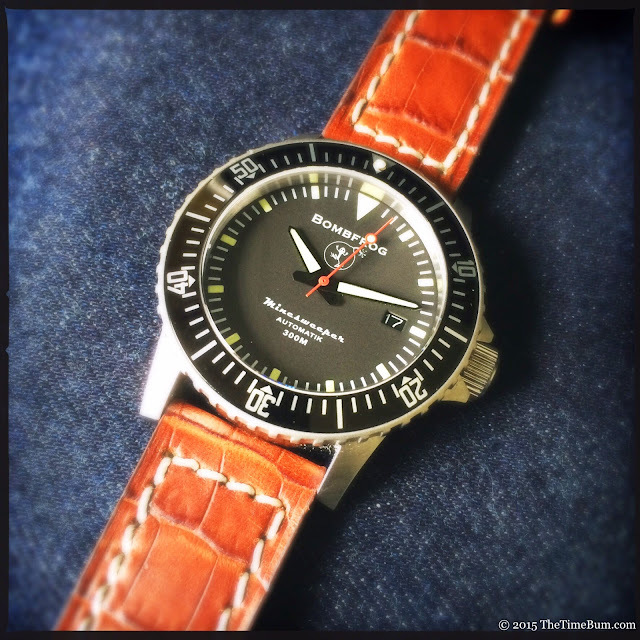 This watch is a limited run of 200 units, and I reviewed #173, so if Froggy appeals to you, I would suggest you act fast. Pro: Tough looks and specs. Sum: Cool, but quirky. If you can forgive the bezel, The Time Bum approves.